Alexander Dining Hall: Completed in 1962 and financed largely by an alumna, Bess Mason Alexander, and subsequently named after her. Nicknamed ‘Alex’ by students, it is located at the back of Clawson Hall. Alumnae Hall: Completed in 1892, constructed with financing from alumnae, and used by students as a library, laboratory area, art department, and more. Contained an elaborate stained-glass piece, The Tillinghast Window, that was later displayed at the Chicago World’s Fair, and is now in Kumler Chapel. It was located between Boyd Science Hall and Peabody Hall, but torn down in 1977. 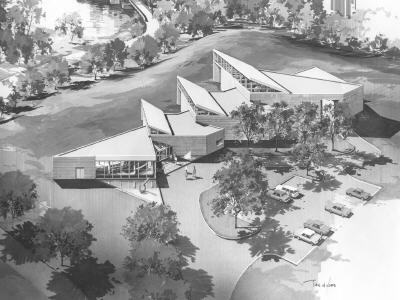 Art Museum: Completed in 1978 and designed by Walter Netsch of Skidmore, Ownings, and Merrill, Chicago. Home to a three and a half acre sculpture park. Boyd Hall: Completed in 1947, it was originally named Science Building but renamed for former President William Waddell Boyd in 1963. It has a greenhouse attached to the side. 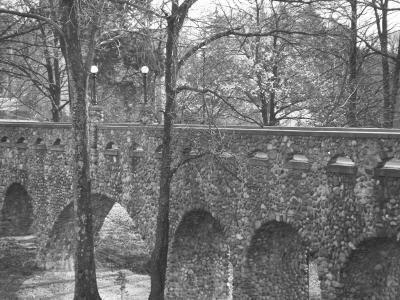 Bridges: Designed and built by Cephas Burns, who took great pride in his work, to the extent that he hand selected all the stones from local creeks and quarries. Contracted by Dr. Boyd to replace all the wooden bridges with stone. Clawson Hall: Built in 1948 as an alumnae project, though a large amount was given through the will of Edith Clawson. Alexander Dining Hall was built adjoining the back of the dorm in 1962. Currently home of Miami University’s International Dorm. 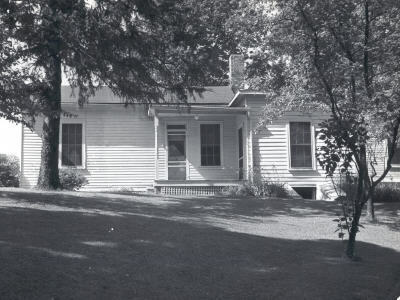 Corson House: Built as home to Dr. Oscar Corson sometime before 1931. Staff of the University had the option to build on Western property with the understanding that the building would eventually revert back to the college. After the death of the Corsons, the property was passed to Western College. 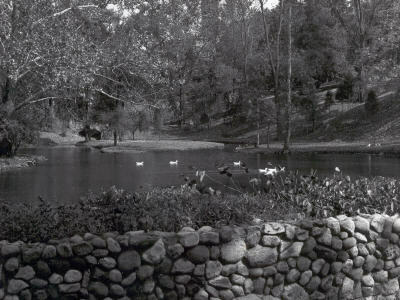 Duck Pond and Ice House: Man-made pond that was home to two swans donated to Western College. Ice House was converted around 1900 to a boat house when the water level in the pond reached new levels. Bridge over the pond was designed by Cephas Burns. 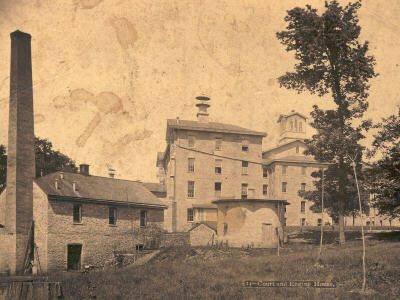 Engine House: Built shortly after the third Peabody Hall was complete, to provide heat and later electricity to the college. One of just three building built before 1900, Peabody Hall and Alumnae Hall. Still in use to this day though its means for generating power have changed, now it works mainly with coal to generate steam. 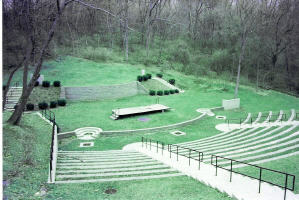 Ernst Nature Theater: Completed in 1922 and dedicated on Tree Day, a former Western tradition. Gift from Sen. Richard Ernst. Theater is used for concerts, plays, festivals and many other outdoor events. 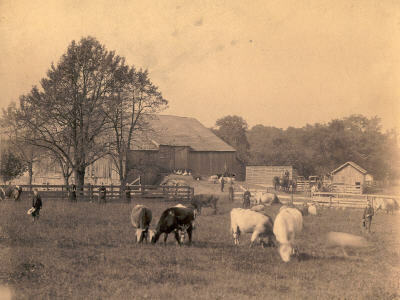 Farms: Western College owned a total of five farms over the course of its history. 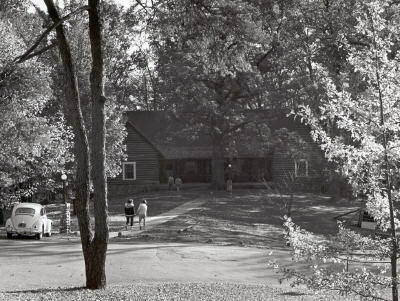 Farm 1: the Main Western College Farm; grew mainly corn and wheat; also vegetables for college; raised pigs; sold in 1956 as the Juniper Hills subdivision. Farm 2: the Dairy Barn; sold in 1947 after barn burned to the ground forcing closure. Farm 3 & 4: grew corn and wheat for feed; sold before 1943 for unknown financial reasons. Gates: Gates stand at all the major transportation and foot paths that have been used for the Western College over the years. Gates still remain on the sidewalk leading to Patterson Place and at the entrance to the Miami University Art Museum. Grey Gables: Dr. Boyd had the house built in 1930 as a retirement home when he left his position as President of the Western College. 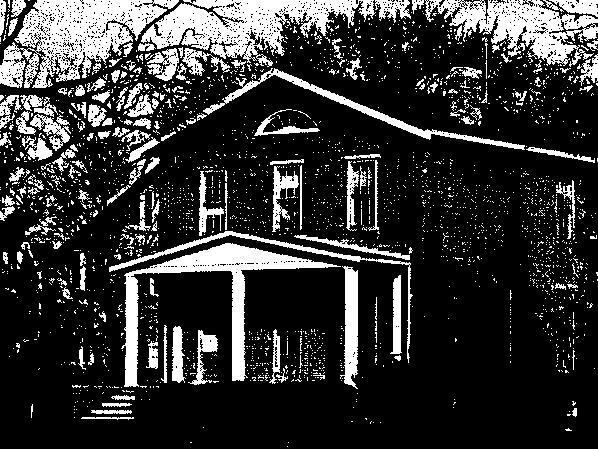 Sold in 1958 to Miami University, it became a guest house and later offices. When Emerson and Tappen Halls were being built, Grey Gables was moved south to the corner of Chestnut and Patterson. Grounds: The Grounds of Western College. Hillside – AKA Barracks or Cottage: Built in 1919, it was hastily constructed in the wartime style to solve a housing shortage. 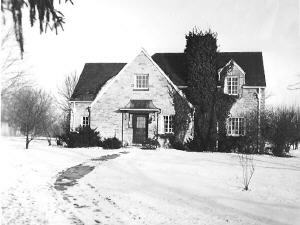 In 1934, it was renovated and renamed the Cottage, and again later renamed Hillside. Meant for temporary use only, it stood for many years and was home to the Infirmary for most of its life. Built attached to the south face of Sawyer Gymnasium. 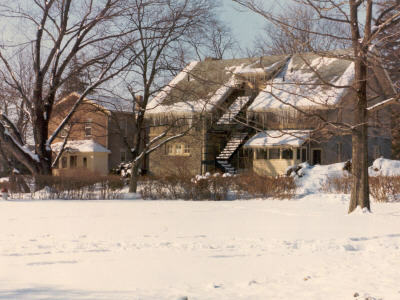 Home Management House – AKA East Cottage: Originally built as a home for the steward, during times of over-crowding it, along with many other houses owned by Western College, was used for overflow student housing. Later, as Domestic Science and Home Economics came about as classes, East cottage was turned into a practice house for student use. Hoyt Library: Completed in 1972 and named after Phyllis Hoyt, Dean of Students 1946-74, it was originally used as a library for Western, to replace Alumnae Hall. Now holds the CPPO, offices and more. Kumler Chapel: Completed in 1918 and named after Reverend Jeremiah Prophet Elias Kumler, a Miami University graduate and Western Trustee and benefactor. The design for the chapel is based on a church in a small Normandy village. The chapel no longer holds regular services, but is used for special events, such as weddings, graduation ceremonies and more. Langstroth Cottage: Built in 1856, it was home to Rev Lorenzo Langstroth, known as the inventor of the moveable frame beehive. Later purchased by Susan Peabody, Helen’s niece, and donated to the Western College. Now home to Miami University International Office and Miami University Luxembourg Program Office. 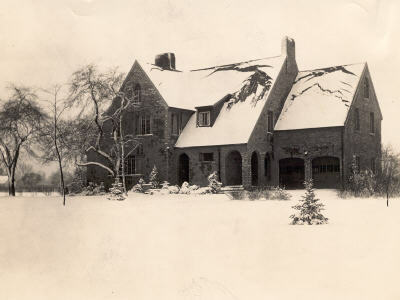 Western Lodge: Completed in 1926, the logs were brought in from Colorado near donor Col. A. E. Humphreys’ home. Used as a headquarters for YWCA when it constructed, it later became a recreation hall, as it is to this day. 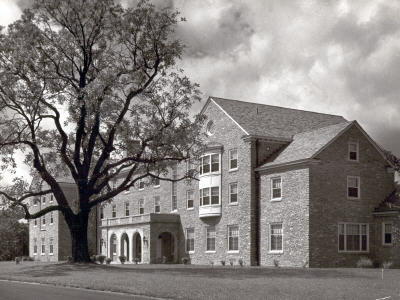 Mary Lyon Hall: Completed in 1934, it was named after Mary Lyon, founder of Mount Holyoke Seminary which greatly influenced Western College. 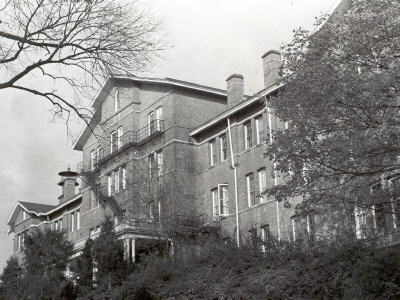 It was built on ground donated by the Patterson Estate and is now one of three dorms still in use for Western students. McKee Hall: Completed in 1904 and originally named “New Hall”, it was renamed in 1917 after Leila S. McKee, an alumna, president, and trustee of Western College. One of three dorms still in use for Western students. 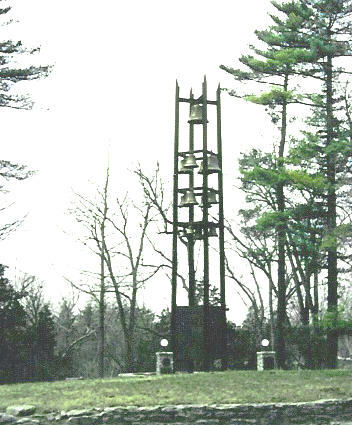 Molyneaux – Western Tower: Constructed in 1978, it houses the 11 original Heath Chimes, formerly housed in the Alumnae Hall Bee Tower, and 3 bells added in 1978. Patterson Place: Completed in 1898 and originally named “Glenwilde”, it was used as a summer home by James R. Patterson, and was his residence at his time of death in 1913. 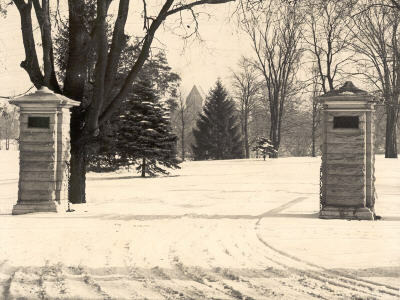 Patterson house and land were given to Western in 1914 and renamed “Patterson Place” and housed the presidents until 1974. Now holds the offices of the Western College Alumnae Association. Peabody Hall: Completed in 1855 and originally named “Seminary Hall”, it was renamed in 1905 after Helen Peabody, founder of the Western Seminary. Burnt down in 1861 and rebuilt, burnt down again in 1871 and again rebuilt. 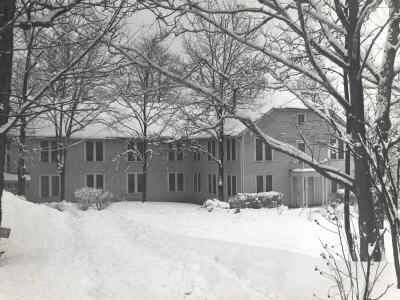 Remodeled in 1974 after the Miami University – Western College merger. One of three dorms still in use for Western students; also houses classrooms and offices. Presser Hall: Built in 1931, the Theodore Presser Foundation covered half of all expenses for the construction of a music hall. Used as a music hall and auditorium for all large College functions. For a period, Presser Hall was used by both Miami University and Western College. The building is still used for classes and lectures in various departments at Miami University. Sawyer Gymnasium: Completed in 1914 and named after then acting president Mary Alma Sawyer, it housed a swimming pool and gymnasium equipment. Used for storage and Ernst Theater dressing rooms. Stancote Cottage: Built in 1933. 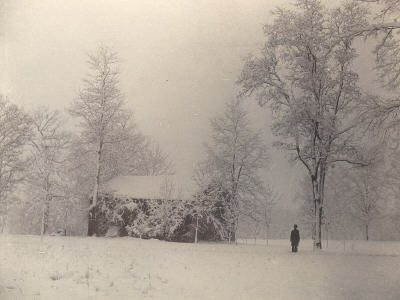 Miss Ida Windate, an English professor at Western College, had the house built. The cottage was later used as housing. 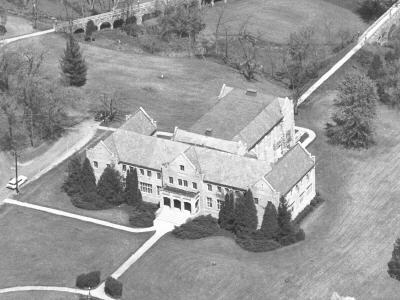 Stancote become part of Miami University, when the merger took place in 1974. Edgar Stillman Kelley Studio: Completed in 1916 and originally used as the home of Edgar Stillman Kelley, artist-in-residence at Western. Financed by the fundraising efforts of the class of 1916, of whom Dr. Kelley was the faculty sponsor. Now available for use by incoming faculty and administration. 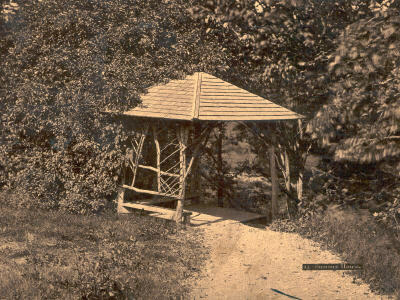 Summer House: Built in the early days of the Western College and located near the pond with a staircase leading down to the north banks of the pond. Cephas Burns modified it to be the stone structure that stands to this day. Thomson Hall: Completed in 1963 and originally called New Dormitory, it was renamed after Mary Moore Dabney Thomson, Board member from 1933 – 1952, President from 1941 – 1945. Currently houses Miami University Students.